The disclosure rule at issue is really just a small-bore response to last year’s sweeping Citizens United Supreme Court ruling, which opened the floodgates to corporate cash in elections. It focuses exclusively on federal contractors because they presumably have more incentive than other private companies to bribe and influence politicians. So why is Issa throwing a fit? Source: US Chamber WatchEvidence suggests that a large part of this dark money comes from companies that feed at the public trough. 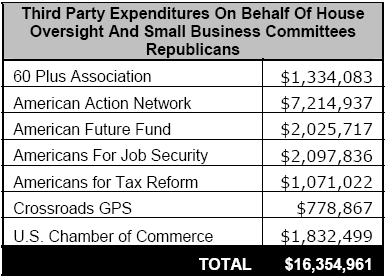 Board members of just one of those dark money groups, the US Chamber of Commerce, earned a collective $44 billion from federal contracts last year, according to Chamber Watch. Only 18 of the Chamber’s 53 board members didn’t land contracts with the federal government. ChamberLeaks: What Did The Chamber Know?